The Battle of Hattin (also known as "The Horns of Hattin" because of a nearby extinct volcano of the same name) took place on Saturday, July 4, 1187, between the Crusader Kingdom of Jerusalem and the forces of the Ayyubid dynasty. 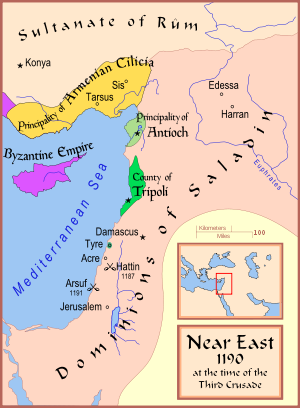 The Muslim armies under Saladin captured or killed the vast majority of the Crusader forces, removing their capability to wage war. 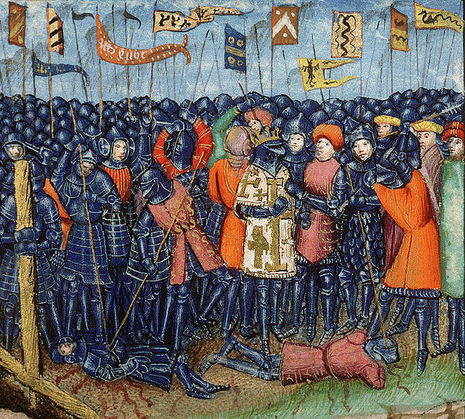 As a direct result of the battle, Islamic forces once again became the eminent military power in the Holy Land, reconquering Jerusalem and several other Crusader-held cities. It was this final act of outrage by Raynald which gave Saladin the opportunity he needed to take the offensive against the kingdom. He laid siege to the city of Tiberias in 1187. Raymond advised patience, but King Guy, acting on advice from Raynald, marched his army to the Horns of Hattin outside of Tiberias. The Crusader army, thirsty and demoralized, was destroyed in the ensuing battle. King Guy and Raynald were brought to Saladin's tent, where Guy was offered a goblet of water. Guy took a drink but was forbidden to pass the goblet to Raynald, because the Muslim rule of hospitality states that one who receives food or drink is under the protection of the host, and that anyone in need of water should be given an adequate amount. Saladin would not be forced to protect the treacherous Raynald by allowing him to drink. Raynald, who had not had a drop of water in days, grabbed the goblet out of Guy's hands. Upon seeing Raynald's disrespect for Muslim custom, Saladin beheaded Raynald for past betrayals. 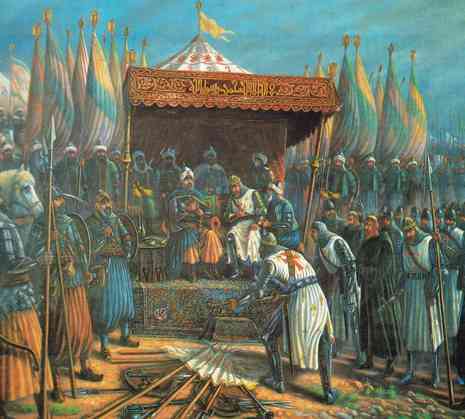 Saladin honored tradition with King Guy; Guy was sent to Damascus and eventually ransomed to his people, one of the few captive crusaders to avoid execution. 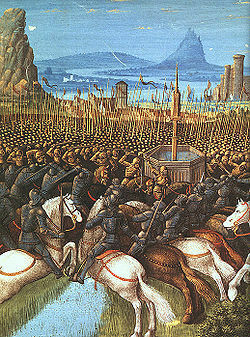 By the end of the year, Saladin had taken Acre and Jerusalem. Pope Urban III is said to have collapsed and died upon hearing the news. However, at the time of his death, the news of the fall of Jerusalem could not yet have reached him, although he knew of the battle of Hattin and the fall of Acre.